Order Beaverdale Wine Starter Kit from the Stirling Homebrew Shop UK. 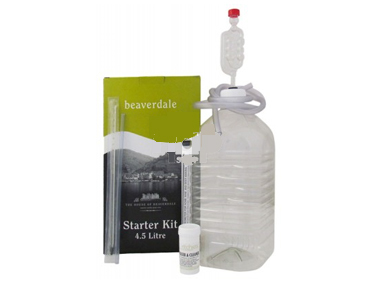 Buy Beaverdale Wine Starter Kit - 4.5 litre and other Homebrew Accessories safely online in the UK. This wine starter kit is a great gift for anyone who would like to make their own wine. Just add any Beaverdale wine kit of choice to get you started! This wine starter kit is a great gift for anyone who would like to make their own wine. Just add any Beaverdale wine kit of choice to get you started! Add any wine kit of choice to make this the perfect gift! Our UK Homebrew Shop sells real Beaverdale and other Homebrew Accessories safely online to customers throughout the United Kingdom in England, Wales, Scotland and Northern-Ireland. Where to buy Beaverdale Wine Starter Kit safely online? Shop at the Stirling Homebrew Shop if you are wondering where you can buy Beaverdale Wine Starter Kit - 4.5 litre safely online in the United Kingdom. Our Homebrew Shop is located in the UK and our independent store has been serving customers in England, Wales, Scotland and Northern-Ireland since 1976. You can buy our Homebrew Accessories online and we post out orders to any UK address. Beaverdale Wine Starter Kit - Beaverdale Wine Starter Kit - 4.5 litre in Homebrew Accessories and Homebrew.